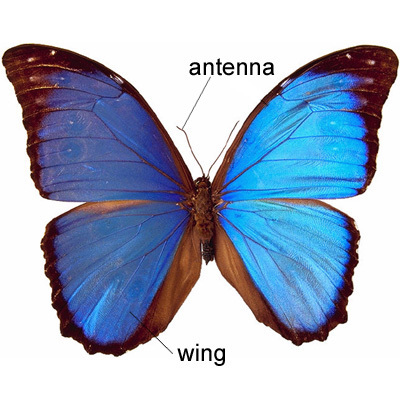 wingwing1 /wɪŋ/ ●●● S2 W2 noun [countable] 1 bird/insect a) HBBHBIone of the parts of a bird’s or insect’s body that it uses for flying a butterfly with beautiful markings on its wings The pheasant flapped its wings vigorously. b) the meat on the wing bone of a chicken, duck etc, eaten as food spicy chicken wings2 planeTTA one of the large flat parts that stick out from the side of a plane and help to keep it in the air3 buildingTBB one of the parts of a large building, especially one that sticks out from the main partnorth/east etc wing the east wing of the palace She works in the hospital’s maternity wing.4 politicsPPGPART a group of people within a political party or other organization who have a particular opinion or aim the moderate wing of the Republican Party → left-wing, right-wing5 sport a) DSa winger b) DSthe far left or right part of a sports field6 car British EnglishTTC the part of a car that is above a wheel SYN fender American English 7 → take somebody under your wing8 → (waiting/lurking) in the wings9 → the wings10 → on a wing and a prayer11 → be on the wing12 → take wing13 → get your wingsCOLLOCATIONSverbsflap its wings (=move them)The ducks woke up and flapped their wings.beat its wings (=move them in a regular way while flying)The female beats her wings as fast as 500 times a second.flutter its wings (=move them quickly)I heard some birds fluttering their wings outside the window.spread/open its wingsThe dragon spread its wings and gave an experimental flap.stretch its wings (=open them completely)The cage was so small the birds could not even stretch their wings.fold its wingsGannets fold their wings and plummet like an arrow into the sea to catch their prey.wings flapDusky wings flapped overhead.wings beatTheir great wings beat slowly.adjectivesoutstretchedThe eagle descended on outstretched wings. wing• We watched pelicans winging down the coastline.• Really, I just wing it: no notes, no talking to witnesses.• She sent a silent message winging to the small room at the Admiralty.wing its/their way to/across etc something• A couple of sets of Scalar strings, courtesy of Selectron, will be winging their way to you soon!• His resignation was winging its way to Sheppards yesterday afternoon.• Photographs had winged their way across, and presents at Christmas and Easter, with Mammy's birthday a speciality.• Readers' original gardening tips Another batch of £50 cash prizes are winging their way to this month's top tipsters.• Within seventy minutes each plane has been unloaded, reloaded and winging its way to destination cities.